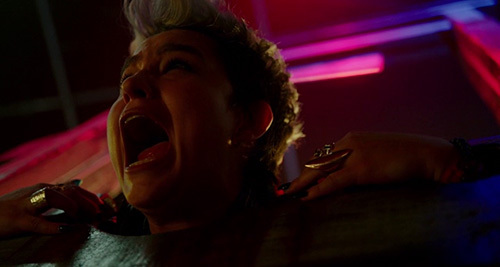 Director: Gregory Plotkin / Writers: William Penick, Christopher Sey, Stephen Susco, Seth M. Sherwood, Blair Butler, Akela Cooper / Cast: Amy Forsyth, Reign Edwards, Bex Taylor-Klaus, Christian James, Matt Mercurio, Roby Attal, Tony Todd, Stephen Conroy. A surprise big screen slasher flick that came along just before Halloween, undoubtedly cashing in on the success of Happy Death Day (albeit in a super limited release in Europe). This straightforward loon-stalks-teens-at-the-fair fare contains almost zero surprises, but is nicely pieced together and can boast some decent practical FX work. The hooded and masked assailant has a penchant for stabbing shrieking girls at interactive horror events. Bystanders think they’re watching actors, who’s gonna help? Student Natalie returns to her hometown for the weekend and ends up dragged along by her best friend Brooke, annoyingly enthusiastic Taylor, their respective boyfriends, and her own crush Gavin. They go through mazes, on ghost trains, act a little more scared than is likely, and Natalie is creeped out by hoodie man, who keeps turning up wherever they go, until it turns out there are a dozen or so actors in the same mask. Against all conceivable odds, this guy succeeds in trapping each of the gang alone in a crowded park for long enough to stab, hammer, and syringe them to death, all the time anxious to get his paws on Natalie – though curiously squandering a couple of opportunities to do so for no apparent reason. His teleporting abilities notwithstanding, there are some tense situations here and there and a good turn from Forysth as the heroine: She beats him with a weapon until the thing breaks, rather than the customary one smack before dropping it. 755 slasher movies before this have left me a little jaded and I could see where it was headed at every turn, possibly diluted by the whopping six credited writers – a case of too many cooks in the kitchen? 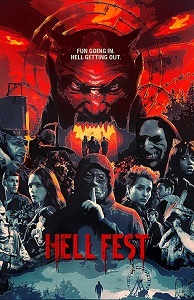 Though it turned a moderate profit, I doubt Hell Fest II will be gracing our screens anytime soon, but in the realms of does-what-it-says-on-the-box plotting, there’s enough to like here from the remnants of The Funhouse, Dark Ride, and a few lesser Halloween haunted house walk-throughs..
Blurbs-of-interest: Bex Taylor-Klaus was audrey in Scream – The TV Series (Seasons 1-2); Tony Todd was Candyman, Bludworth in Final Destination‘s 1, 2, and 5; Hatchet and its first sequel, iMurders, Jack the Reaper, and Scarecrow Slayer. I’m honestly quite surprised with this one! It’s on-the-nose with everything good about slashers despite not really going all out! Really love the (for me) disturbing twist ending!